As specialists, designers, manufacturers and global distributors of Fiber Optic Fusion Splice Protector Sleeves our business philosophy is simple. We provide the highest quality certified product, with proven long-term reliability, cost-effective pricing and excellence in customer service. This drives our business and has done for the past 24 years and we are now recognised as the industry leader in this specialist market. Our standards are high, FinishAdapt fiber splice protector sleeves are manufactured from high quality irradiation cross-linked Polyolefin materials which meet MIL specifications and are UL approved (YDPU2.E467437). 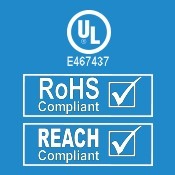 All of our splice protector sleeves are ROHS / REACH compliant and are ‘Conflict-Free’. Our single fusion splice protector sleeves are suitable for single and multimode optical fiber from 250 µm up to 900µm and multiple mass ribbon fiber protection sleeves. Our products are installed using the widest range of optical fibers and fusion splicers and fit the majority of splice trays and splice enclosures. FinishAdapt are proud to be official resellers of Fujikura Fusion Splicers. With superior technology, proven reliability and high quality Fujikura are the market leaders in this specialist industry. Our range includes the most popular 62S and fastest and automated 70S Core Alignment fusion splicers (PAS – profile alignment system) to the smallest and lightest 22S Active V-groove and 12S Fixed V-groove Cladding Alignment fusion splicers. Suitable for standard single mode SMF, multimode MMF and speciality DSF and NZDSF optical fibers. Backed by Fujikura, we can offer competitive fusion splicer pricing, product demonstrations, training, servicing and repairs together with a full range of tools and accessories. See Fujikura Fusion Splicers for further information. As innovators in the design and manufacture of fusion splice protector sleeves, FinishAdapt have worked with leading organisations in the development of fusion splicing technology. Finishadapt are at the leading edge of splice sleeve development. With a focus on innovation and quality we developed the ‘Pre-shrunk’ splice sleeve design, enabling easier and faster installation. The first to use Ceramic strength members in mass ribbon splice sleeves. Designed ‘flexible’, Mini and Micro splice sleeves that now form our comprehensive 6A range. We continue to focus on development and manufacture and help our clients design products to specification and supply own label solutions to leading manufacturers and distributors worldwide. With global sales and operations across three continents in the UK, USA and China, our customers include major manufacturers and leading distributors to fiber optic contractors, fiber installers and numerous photonics OEMs and end users. Our products are used in numerous optical fiber installation applications including communications network infrastructure; fibre to the cabinet (FTTC) and fiber to the exchange (FTTX). Broadband, fiber to the home (FTTH), access networks, telecommunications and utility networks, outside plant cabling. Enterprise and premise networks; fiber to the premises (FTTP), data centres, LAN and CATV networks. Specialist Photonics applications include; optical fiber lasers, sensors, amplifiers and transducers, opto-electronics. Fiber optic OEM, devices and components and numerous military, aerospace, ship, aircraft and medical applications. Find out more, contact us now.